This is the scene in Axbridge in Somerset on Boxing Day. The Weston and Banwell Harriers do not hunt foxes but follow a scent laid down for the hounds to follow. However there is criticism of such hunts about the land they sometime operate on – National Trust land around Crook Peak on the Mendips – and whether they don’t ‘by accident’ catch and kill wildlife that the hounds chance upon. 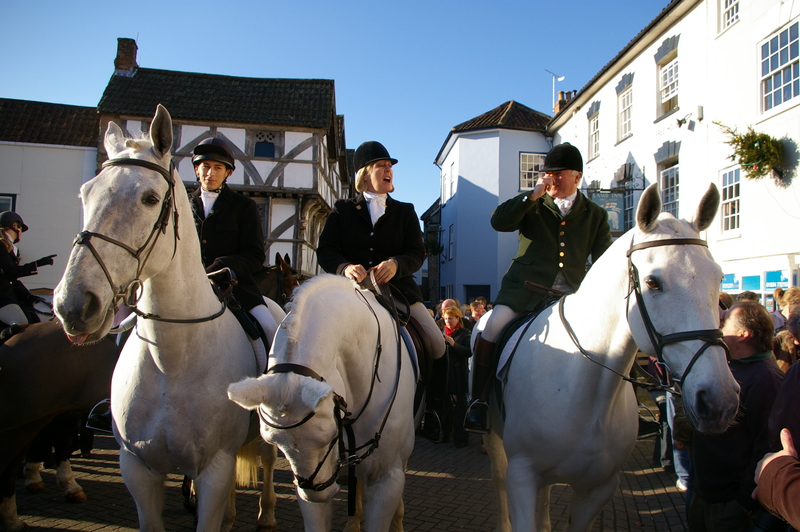 A defense of the hunt can be found here: http://www.countryside-alliance.org/questions-should-be-asked-following-the-weston-banwell-result/ while criticism of the hunt can be found here: https://www.facebook.com/localsagainstwestonandbanwellharriers/ The meeting on Boxing Day is well attended and certainly makes for good photo opportunities and PR for the hunt. The Hunting Act of 2004 sort to end abuses of hunting by hounds – but there is still considerable opposition to the sport – which in part is to do with the social history of the UK and seeing blood sports as a sport – which includes shooting and fishing. And there is a strong lobby in support pointing to the positive impact the social and business aspects of hunting groups have on rural communities. It’s a debate that is set to continue.